Today is launch day for Windows Phone 7 in the UK – but the hoped-for crowds of people waiting to buy the new phone failed to appear. They are billed as the handsets that could topple the iPhone. Yet as Microsoft’s Windows 7 phones went on sale this morning there was not a queue in sight. reported the London Evening Standard. Microsoft has inexplicably omitted from Windows Phone 7 key features now common, or becoming so, on competitive phones. These missing features include copy and paste, visual voicemail, multitasking of third-party apps, and the ability to do video calling and to use the phone to connect other devices to the Internet. The Android phones and the iPhone handle all these things today. I couldn’t find a killer innovation that would be likely to make iPhone or Android users envious, except possibly for dedicated Xbox users. Is he right? In some ways it does not matter; perception is reality. That said, none of his missing features strike me as deal-breakers for a majority of users. You can also argue that Microsoft has learnt from Apple not to put every possible feature into the first release, but rather to make the features it does implement work as well as possible and to build on that in the future. The problem is that there is so much momentum around Google Android and Apple iPhone that the average consumer looking for a smartphone will need a lot of persuading before paying out for Windows Phone 7, or even really noticing it. Microsoft needed rave reviews, not so-so ones. There is a danger that the new phone may suffer the same fate as Palm’s webOS devices, well liked by those who take the trouble to explore them, but absent from the mainstream of consumer consciousness. I’ve had a device for a few days, and it has been favourably received by people I’ve shown it to. Some of the games look great – The Harvest, for example, a Microsoft exclusive. The Facebook integration is also appealing to fans of that site, and feels deeper than Facebook apps on other devices. Windows Phone 7 does have distinctive features. I’ll be reviewing the device properly in due course. What is more interesting than my opinions though is how the phone is received in the market. I had expected more interest from the curious on day one of retail release. Update: Microsoft found a queue or two for its press release today. Big in Australia? Today Microsoft announced Office 365, though it is not really a new product. Rather, it pulls together a bunch of existing ones: Business Productivity Online Suite (BPOS), Office Live Small Business, and Live@edu, the cloud . It also impacts the desktop Office business, in that with at least some varieties of Office 365 subscriptions, users get the right to download and install Office 2010 Pro Plus edition. This rebranding is a smart move. I have long been mystified by the myriad brands Microsoft users for its online offerings. I hope this will all integrate nicely with the new Small Business Server “Aurora”, a forthcoming version of SBS designed to bridge the cloud and the local network. If it does, this will be attractive for small businesses – who will pay $6.00 per user per month, we were told today – as well as for larger organisations. Enterprises will pay between $2.00 and $27.00 per user depending on which services they buy, and can get extra features such as unlimited space for email archiving. I also find it interesting that Microsoft has won what sounds like a bitter battle with Google for the migration of the State of California to online services. No doubt Microsoft can make a case for its cloud offerings, but I suspect a lot of it is the power of the familiar. If you already run on Office documents and Exchange email, moving to online versions of the same applications will seem a smoother transition. There is also the document format issue: you can import Office documents into Google Apps, but not with with 100% fidelity, and the online editors are basic compared with Microsoft Office. When Microsoft seemingly had no idea what the cloud was about, it was easier for Google to win customers. Now Microsoft is slowly but surely getting the idea, and the value of its long-standing hold over business computing is being felt. Google is also winning customers, of course, and even if you accept that Office 365 is the future for many existing Microsoft-platform businesses – and, Microsoft will hope, some new ones – there are still a host of interesting questions about the company’s future. One is how the numbers stack up. Can Microsoft as cloud provider be as profitable as Microsoft has been with the old locally installed model? Second, what are the implications for its partners? In today’s press announcement we were told that customers migrating to BPOS report a 10%-50% cost saving. The implication is that these companies are spending less money on IT than before – so who is losing out? It could be Microsoft, it could be hardware suppliers, it could be integration partners. Microsoft does include potential for partners to profit from Office 365 migrations, presuming it follows the BPOS model, but partners could still be worse off. For example, if support requests diminish,because cloud services are more reliable, and if Microsoft does some support directly, there is less opportunity for partners support services. Finally, what are the implications for developers? The main one is this. Organisations that migrate to online services will have little enthusiasm for locally installed custom applications, and will also want to reduce their dependence on local servers. In other words, custom applications will also need to live in the cloud. Ray and I are announcing today Ray’s intention to step down from his role as chief software architect. He will remain with the company as he transitions the teams and ongoing strategic projects within his organization … Ray will be focusing his efforts in the broader area of entertainment where Microsoft has many ongoing investments. It is possible that I have not seen the best of Ozzie. His early Internet Services Disruption memo was impressive, but the public appearances I have seen at events like PDC have been less inspiring. He championed Live Mesh, which I thought had promise but proved disappointing on further investigation, and was later merged with Live Synch, becoming a smaller initiative than was once envisaged. Balmer says Ozzie was also responsible for “conceiving, incubating and shepherding” Windows Azure, in which case he deserves credit for what seems to be a solid platform. Ozzie may have done great work out of public view; but my impression is that Microsoft lacks the ability to articulate its strategy effectively, with neither Ozzie nor Ballmer succeeding in this. Admittedly it is a difficult task for such a diffuse company; but it is a critical one. Ballmer says he won’t refill the CSA role, which is a shame in some ways. A gifted strategist and communicator in that role could bring the company considerable benefit. Adobe has announced Acrobat X (pronounced Acrobat ten), the latest PDF document creator with its associated free reader, which will be available in November. The Acrobat product is a bit of a chameleon. The PDF format – now an ISO standard – has three distinct roles. The first and original role is as a means of distributing electronic documents that look the same everywhere. This has never been a goal of HTML, which was designed to give the browser, or “user agent”, flexibility over how to render documents. Word processor formats are also compromised in this respect, because they are for editing, whereas PDF is for output. This is how most users encounter PDFs – a document format which is somewhat annoying, especially when it opens to a full page view and you cannot read a thing, but which does show each page as originally designed. The second role is for print professionals. This is a logical extension of the first role: the same characteristics make it ideal as a format for delivery to a printer. If terms like Preflight, Calibrated CMYK, Trap presets and Job Definition Format mean anything to you, this may be how you use PDF. The third role is as the forms client in Adobe enterprise workflow systems. When I attended Adobe’s Partner Conference in Amsterdam, this usage was the area of focus. I saw case studies such as processing applications for planning permission, invoicing, and health insurance applications. Is there any conflict between these roles? I believe there is, though Adobe will disagree. 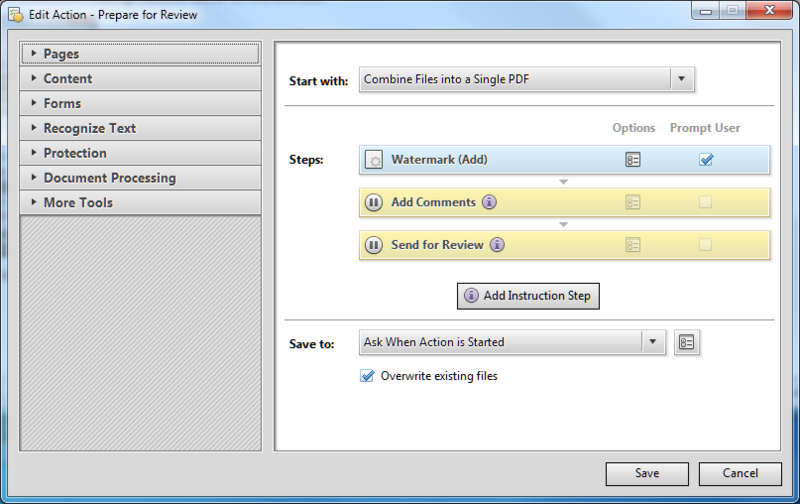 There are features in Acrobat and Adobe reader which exist to support its role in enterprise systems, but do not matter to the more common use of PDF, for distributing static documents. In particular, the ability to execute script and host Flash applications has value if you think of PDF as an application client, but if you just want to read a document it adds bloat and security risk. Still, we should not complain too much. PDF is both useful and, for most of us, free – particularly now that PDF export is a standard feature in Microsoft Office and in many Mac applications. After that preamble, what is new in Acrobat X? I’ve been trying a late pre-release, and from what I have seen the changes are more in the realm of the user interface, usability and security, than in new capabilities, though I would still describe this as a major update. Here are the highlights. First, Adobe has responded to PDF security issues by introducing a new protected mode on Windows, which according to Adobe is the only platform where significant malware attacks via PDF occur. All write calls are sandboxed by default, making it hard for malware to infect a PC. Apparently this is just the first phase, and a future version will restrict read calls as well. Another weakness in the current sandbox is that it does not protect the Windows clipboard. Second, Adobe has polished and simplified the user interface. In a web browser, a PDF appears without any additional controls or toolbars other than a small toolbar that appears if you hover the mouse around the bottom centre of the page. Adobe’s intent is to make moving from HTML to PDF so seamless you hardly notice, further embedding the format into the web. 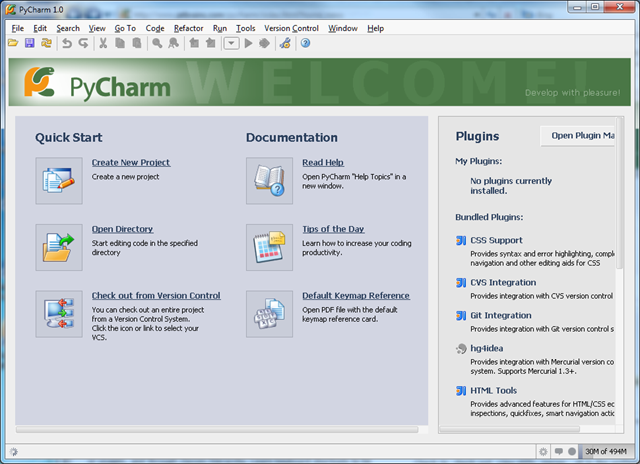 Acrobat’s user interface has also been revamped. 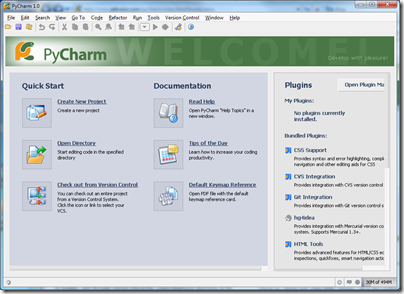 There are a few basic commands on the traditional menu and toolbars, but most of the features are accessed through a tabbed right-hand column, with tabs for Tools, Comments and Share. It is similar to the old Office task pane. I think it is successful, making features easier to find and use. 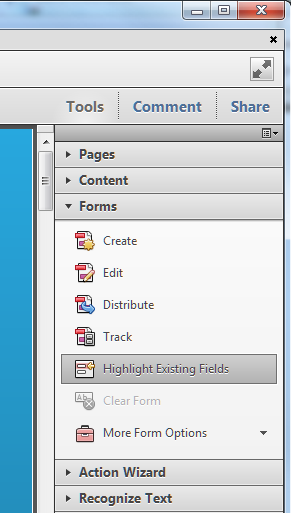 One of the sections in the Tools pane is called Action Wizard, which is a new macro feature in Acrobat Pro. “Macro” is not quite right; it is more of a wizard authoring tool, with some pre-prepared wizards that you can use as-is or modify. The following illustration shows one of these wizards in edit mode. The Action Wizard should both speed up repetitive tasks, and ensure that important steps are not omitted. The focus is on preparing documents, for example for review, distribution, or web publishing. Third, Adobe is having another go at the portfolio feature, introduced in Acrobat 9 but perhaps not used as much as the company had hoped. Portfolios let you combine multiple documents into one, for single file distribution with some added features in the container. If you are nostalgic for the Microsoft Office Binder, you will like Portfolios. Acrobat X makes portfolios easier to create, and adds features like layouts and visual themes, so you can achieve slick effects with little effort. Organisations might create their own themes so as to promote their brand. 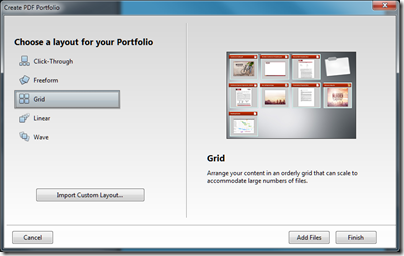 It is cool stuff, but if the portfolio feature in Acrobat 9 found little use, I am not sure that this new improved version will make much difference. Maybe the need for gathering multiple documents into one is not as great as Adobe imagines. 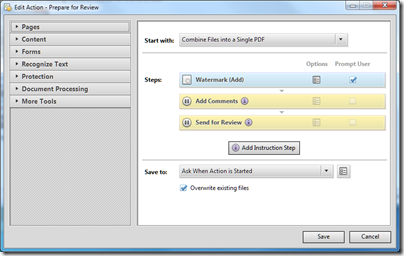 Other features include Microsoft SharePoint integration, enhanced OCR (optical character recognition), and improved copy and paste from PDF to editable documents such as Word and Excel, while preserving formatting – this last quite an important feature since this is a common source of frustration. 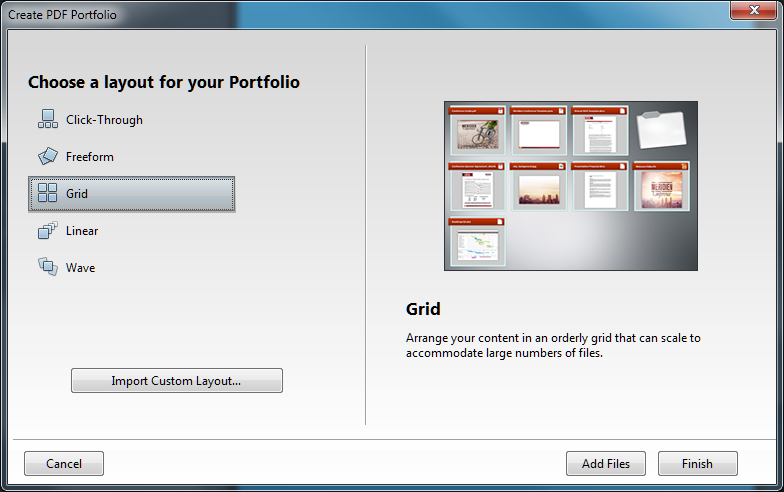 I am not sure about portfolios, and have some concern that Adobe has pushed too many features into Acrobat. Nevertheless, I found myself liking the new Acrobat. The usability effort has paid off, and I found it more enjoyable to use than previous versions. Performance seems better as well. Taken together with security improvements on Windows, this is a welcome upgrade. I was interested to see that National Rail Enquiries has published a web service for its live departure boards. 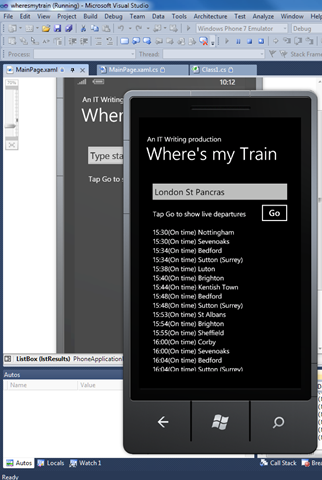 These give you reports on the next trains to depart from any given station, including information on late running. Given that this is Windows Phone 7 week, I could not resist trying it out. I have a minimalist UI – you type in a station and hit Go. In version two you will just press Enter. It fetches the live train departures and displays them in a list. Version two might have a scrollbar too. Still, I’m pleased with the results, which could actually prove useful when I am running for a train. Confession: it is currently hardcoded for just a few stations. That’s because you need to look up the station code in this table. I need to embed this database in my app somehow. The coding is pretty simple though. It may help that the National Rail Enquiries web service is based on .NET, which is also why it does SOAP and WSDL, to the disappointment of those looking for REST. All the hard stuff is done by Add Service Reference in Visual Studio. The web service call is asynchronous, but there is a code completion wizard to add the necessary event handler. This Web Site is for your personal and non-commercial use. You may not at any time modify, store, copy (including for example screen scraping), extract, reutilise, distribute, transmit, display, perform, reproduce, publish, license, create derivative works from, transfer, or sell, distribute or create any information, products or services obtained from, linked to or using this Web Site and any data therein or that may provide users with the ability to do the same. For the purposes of these Terms & Conditions the term Web Site also includes the web services, XML and any other data source supplying the Web Site. Oh well. It still shows how quickly you can knock together a client for a web service and make something useful, although mine is really only a proof of concept. I reckon it would be almost as easy in Adobe AIR too – and then it would run on Android. There is a National Rail Enquiries app for iPhone which costs $7.99 and likely uses the same web service.